Philadelphia Riots Collection; owned by the American Catholic Historical Society this collection documents early issues related to domestic violence, gun ownership, militia deployment, and crime. As well this is an important collection for the history of Villanova University. 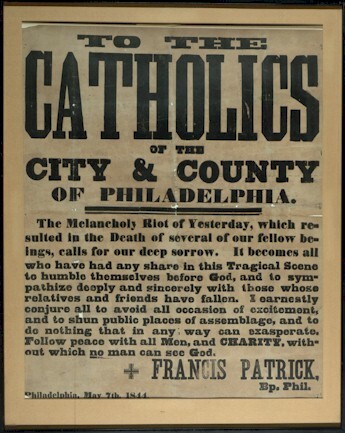 Known as the Philadelphia Riots, as well as the Philadelphia Nativist Riots,these disturbances inadvertently created a climate inhospitable to Catholics in the inner city, and let to the expansion of Villanova, first as a College and then later as a University. The Main Line area beckoned to the Order of Saint Augustine after the experience of the burning of St. Augustine’s Catholic Church as a more rural and safer haven for education so the initial “Augustinian College of Villanova” which opened in 1842 was greatly expanded. This collection includes letters to and from the Philadelphia Sheriff at the time, Morton McMichael; letters and orders to and from Major General Patterson; lists of the Posse members sent to hunt for the arsonists; and a broadside from Bishop Kendrick calling on the Catholic citizens of Philadelphia to remain calm and not to resort to violent in retribution.